Residencia Estates in Elviria, Marbella, was the first real estate agency to implement a mobile website for smartphone users which placed them in pole position with the season starting and tourist pouring in from all over the globe, many of them scouting the Marbella real estate market for their new (second) home. Since most people won’t drag along their computer, they sure will be using their smartphones while visiting Marbella. And just there laid the challenge and opportunity for a progressive agency such as Residencia Estates. Knowing that more than half of searches happen from smartphones these days, especially in areas like Marbella where the population consists of mainly tourists, not having a mobile website is a handicap. Statistics show that when people land on an unoptimised site, they leave with seconds and tend to never go back to that site. Embrasing the mobile website can literally double or more the number of really interested people looking for your service. About a third of people searching on smartphones and finding what they need easily via a mobile website, contact the business. This conversion rate of 35% stands very strong versus a merely 2% of computer user searches. Residencia Estates saw that potential and smartly decided to not only develop a mobile website for their entire agency in Elviria, Marbella, they added two mirror mobile websites for two of their instrumental urbanisations (Elviria Hills and Haciende Elviria). 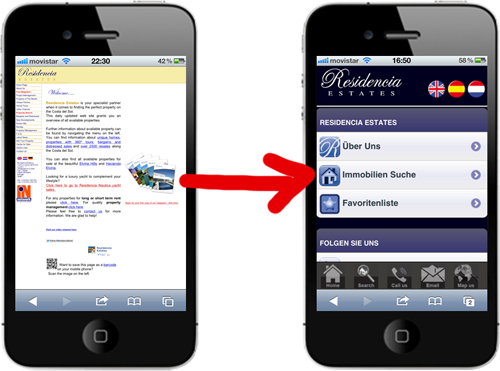 Their mobile websites can be found the same way you would google any other real estate using Google on your smartphone; once you click the search result, the mobile website will appear instead of the regular website, giving you a convenient and nice experience while visiting Marbella…in one of the four languages the site contains…and adapting to yours automatically! Check out their websites from any smartphone at residenciaestates.com – elviriahills.com – haciendaelviria.com.